How about incorporating some modern luxuriation into your garden, combining the relaxing essence of nature with the undulating ripples of blue water? As a huge proportion of Americans have pools in they’re backyards, having some thought about how this works with your landscape will make yours stand out a mile. Home Design Lover sums up what a well crafted garden pool should have. A swimming pool isn’t just a water in a concrete vessel or whatever material found in your home. It has to have other features too and accessories that will make it look more inviting and beautiful. That is why we add some lights, sculptures, fountains, waterfalls and others to make it appear more welcoming and relaxing as well. Another thing that we mostly see with the pool is a garden. A pool garden would be an awesome place for anyone to relax and unwind. Sitting or lounging in the pool deck with plants around you will make you feel near nature and it will also add to a stress-free environment. It is the feeling of freshness that makes plants valuable to anywhere in the house. How much more for a pool area? Say goodbye to a dull and boring pool area! If you are going to redesign your front or backyard with a pool, the landscape is also a very important element to consider. Get this right and you will add a touch of class and continuity to your project. Just like the right choice of bricks and tile is essential in getting the theme of a house correct the same is also true if you are putting in or overhauling your pool. The end result can also add a surge in your real estate value. Pool design and also landscaping is a very difficult task for most people. If you are unsure you should contact professional landscape designers and have a detailed consultation as to what you need, which should naturally include plans of your home and gardens. If they also pay a trip to your home and conduct detailed measurements they will do an even better job. It’s important to look at the previous portfolio of clients the designers have. This will also give you great ideas of what you could do at your place as well. Pools today have all sorts of accessories built into them and not just elegant gardens built into their surrounds. 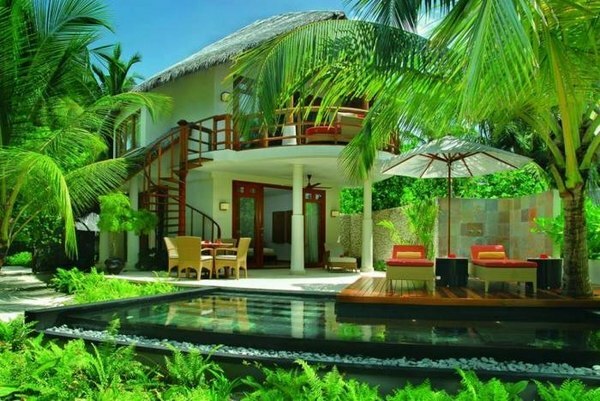 Some are built on a tropical island theme like this below. A pool can be subtly embedded into your existing backyard like this Long Island home below. It’s perfect for relaxation and entering friends and guests and doesn’t become an unsightly blip on the landscape. Fancy a stroll around the garden and perhaps a dip after that? It’s all possible with this well crafted garden pool. 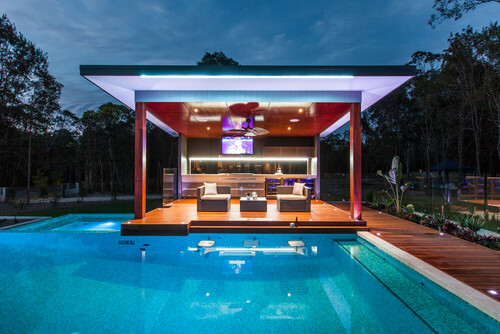 Or how about something that completely compliments the surroundings such as this stone and timber encased pool house and pool which is encased in a spacious garden expanse. Can you see yourself bathing and skinny dipping here? Whether you want an all out luxurious spa, or a replication of your favorite tropical island, or a complete modern party zone, hire the right designers, or go straight to a reputable pool building company with the right credentials and portfolio to match and you can bring your ideas to life. Copyright © 2019 Gardeners Palace. All rights reserved.